Chibuluma Mines Plc, a copper mining company, which is a subsidiary of METOREX LIMITED, is one of the first two copper mining companies to be privatised in 1997. Metorex Limited acquired 85% of the shares with ZCCM Investments Holding Plc holding the remaining 15%. The company operates the Chibuluma South and Chifupu ore bodies. The Company is located in Lufwanyama District. Metorex Limited is part of the JINCHUAN Group. The Company currently produces 10 000 tons of copper in concentrates per year with the copper concentrates being sold to local smelters. Geological mapping of the area in which Chibuluma Mine is situated began in 1928 but all prospecting was halted during the depression years. In 1951, the Roan Selection Trust Limited decided to open up the Chibuluma (East) deposit which was the first deposit to be discovered on the Copperbelt by scientific means and was intersected by drilling in 1939. Roan Selection Trust Limited was formed in 1914 by an American engineer Alfred Chester Beatty who later took up British citizenship. Operations at the separate Chibuluma West ore body, now commonly known as 7 Shaft, commenced in 1963. The Chibuluma Mine South ore body was discovered in 1969 by Roan Selection Trust (RST). A total of 113 diamond drill holes were drilled in the area, of which 77 drill holes intersected the Chibuluma South ore body. Ore body intersections were spaced between 75 and 150m apart. Metorex drilled three twin holes in 1999 and verified the thickness and grade of the ore body as defined by the historical drilling. Following the 1968 Reforms the government of the Republic of Zambia (GRZ) declared its intention to acquire equity holdings (usually 51% or more) in a number of key foreign-owned firms. By 1970, GRZ had acquired 51% in the RST mines and formed Roan Consolidated Mines Limited (RCM). In 1982 RCM was merged with Nchanga Consolidated Copper Mines Limited (NCCM), formerly Anglo American controlled to Form Zambia Consolidated Copper Mines Limited (ZCCM) with GRZ holding 60.28% interest. In the 90’s GRZ commenced privatizing its mining assets and the Chibuluma assets were sold to Metorex ltd, a South African mining company. GRZ retained a 15 % shareholding in the new company –Chibuluma Mines plc. In 2001, Chibuluma Mines plc developed a small open pit with a concentrator and a leach/cementation plant to exploit the upper oxide zone of the Chibuluma South ore body. In September 2001, operations were suspended due to low copper prices and the mine placed on care and maintenance. In order to develop an underground mining operation a new company, Chibuluma South Mine Limited, was formed on 26 September 2003. The underground operation mines a copper sulphide resource. 7 Shaft was closed in 2005 when the ore body was exhausted and most of the work force transferred to Chibuluma South. In July 2007, Chibuluma South Mine Limited ceased to exist and in 2008, the company reverted to its original name: Chibuluma Mines Plc. 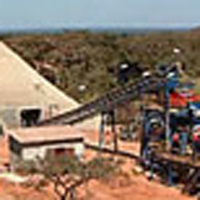 The Chibuluma Mine site is located in a semi-rural area of Lufwanyama District, approximately 10 km south of Kalulushi. As of the 2010 census, the Kalulushi District was home to approximately 100,381 residents. The geographically much larger Lufwanyama District had approximately 78, 503, residents. Lufwanyama District remains relatively underdeveloped in terms of infrastructure. Road conditions, sanitation systems and electrification rates lag behind conditions witnessed in the urban centres of the Copperbelt, including Kalulushi. Beyond Chibuluma Mine operations, the economy is dominated by subsistence agriculture and trading. Kalulushi emerged as a planned company town with the development of mining at Chibuluma West and East in the mid-20th century. Economic activity in Kalulushi (as well as the surrounding area) declined severely with the closure of both sites. The Chibuluma Mine site represents, by far, the largest new investment in the area during the post-ZCCM era. 2003 Chibuluma South Mine Limited was incoporated by Metorex Limited to develop an underground mine and exploit Chibuluma South orebody. 2008 Share-holding for Chibuluma Mines Plc and Chibuluma South Mine Limited were the same, hence Chibuluma South Mine Limited was de-registered to give way for Chibuluma Mines Plc. The copper deposit at Chibuluma South was discovered in the 1960s during a regional exploration programme undertaken by Roan Consolidated Mines Limited (RCM). The Chibuluma South orebody is about 300m in strike and dips about 400 to the north-west and extends to a known depth of 600m from surface. This is delineated by diamond drilling holes. The Chifupu orebody is about 150m in strike and dips about 400 to the north-west and extends to a known depth of 800m from surface. This is delineated by diamond drilling holes. The thickness of the orebody varies from 2m on the fringes to 45m in the central part. The primary copper mineralization is bornite and chalcopyrite. Chalcocite and malachite are secondary with the later confined to upper levels. The mineralization is hosted in Lower Roan Group in coarse grained quartzite called the Orebody Quartzite(OBQ). The unmineralised part of the quartzite is called the Footwall Quartzite(FWQ) which overlies the Granite of the Basement Complex. Chibuluma South Mine is trackless and highly mechanised. The mining method employed is Long Hole Stoping with fill. Access to underground is through a portal. Production commenced at 10,000 tonnes of ore in July 2005 ramping up to 40,000t in July 2006 and 50,000t/month in 2008. Production reached its peak in F2014 when the mine produced 596,821t. Combined production from Chibuluma South and from Chifupu has since reduced to about half from F2016 following the business restructuring carried out in 2015/2016. Upon closure of the Open Pit Mine in 2001, portal mining commenced in 2003 in order to exploit underground sulphide ore. In order to separate Underground from Open Pit, which was closed in 2001, a Crown Pillar was left for both safety as well as avoid waste migration from Open Pit into underground operations. Production commenced on 71mL as the main level by Room and Pillar and continued to 600mL, which was the lowest level. Chibuluma Mines Plc underground ore will be depleted by Q1-F2019. This will be followed by Underground and surface infrastructural reclamation. The Chifupu Mine is located within the Chibuluma South Mine License area. The Project is aimed at exploiting the Chifupu Copper deposit located about 1.5 km south of the current Chibuluma South Mine. Chifupu Mine is trackless and highly mechanised. The mining method employed is Long Hole Stoping with fill. Access to underground is through a portal. The Chifupu deposit was discovered by Roan Selection Trust (RST) in 1967 through a combination of auger and diamond drilling. In 1969, RST discoevered the Chibuluma South Orebody as a strike extent of the Chifupu deposit. Metorex drilled 15 diamond drill holes at Chifupu in 2007; this was followed up with additional drilling of 5 diamond drill holes in 2012. The Chifupu orebody occurs over a strike length of 150 m, dipping at approximately 40° towards the north-west and consists of two ore bodies, each approximately 9m in width, separated by a waste parting of 20 m to 30 m. Drilling has defined the orebody to a maximum depth of 700 m; indications are this orebody remains open at depth. The Chifupu Copper mining project was approved in 2013 following a detailed feasibility study. Mine development works commenced in 2013. In 2014 the feasibility study was revised to furher optimise the technical and commercial aspects of the project. Production commenced at 600 tonnes of development ore from 72mL in May 2016 ramping up to 17,000t of ore per month in 2018. Chifupu Mine ore reserves will be depleted by F2024 at a consistent decline monthly development rate of 90m. Chibuluma Mine has a number of Contractors on site engaged in various mining and other services. The major ones being JCHX and LMMTS. A wholly owned Chibuluma Mines Plc subsidiary LMMTS was incorporated as a Zambian Registered Company on 27 June 2017. This company was set up to be a one-stop shop of mining projects and services including manufacture and trading (marketing) of mining and minerals processing requisites which meet all quality requirements at an optimum cost whilst generating adequate resources to sustainably grow the business and meet the aspirations of all stakeholders. The Company commenced Mining operations at the Chifupu Mine of Chibuluma Mines Plc on 30 August 2017. Equipment maintenance – Loader buckets, Dump truck dump bodies, fixed plant etc.